If you require further information on any print featured here, please contact us. When a print has been sold it will be marked as Sold. Click on a thumbnail (left) to link directly with the entry for that print, or scroll down to view all the selected prints from the current Home Page. 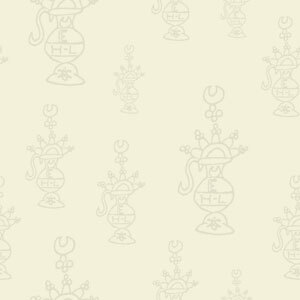 Images are not at very high resolution. 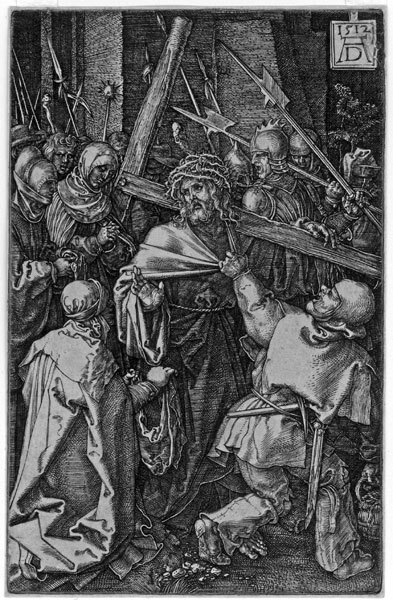 Dürer represented scenes from the passion of Christ throughout his life, beginning with the ‘Large’ woodcut Passion, commenced in 1497, completed in 1510. The ‘Small’ woodcut Passion followed in 1511. Meanwhile he began the Engraved Passion in 1507, which occupied him till 1512. The engraved Passion, intended for an upmarket audience, is more intimate, the figures more sculptural and the scenes more enclosed, with only hints of any distant background. In both the woodcut versions of Christ bearing the cross, he is shown falling beneath the weight while in the engraving he still stands upright. The woodcuts are daytime scenes, the engraving, innovatively, a night scene. Original engraving, 1512, for the Engraved Passion. The plate signed with the monogram and dated. Second state with the ‘hanger’ on the monogram tablet. A very good impression, trimmed to the platemark and remargined with thread margins. A tear and repair affecting the tablet. A couple of patches verso strengthening past skimming, not affecting the engraving itself recto. St Veronica is shown kneeling in front of Christ, holding out her veil. Panovsky points out that presenting this subject as a night scene is iconographically unprecedented. Daubigny was in the van of the French etching revival and produced some of his masterpieces in the medium for his two ‘Cahiers’ (portfolios) each of six etchings, made in 1850. 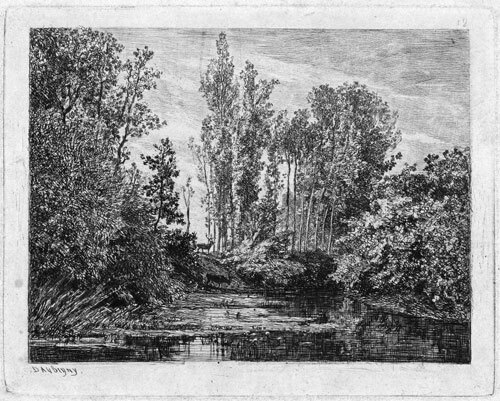 He was particularly drawn to subjects with water, and the landscape in the valley of the Oise at Bezons featured in several plates of the series. Original etching, with traces of rocker work, 1850. One of the Cahier series. The plate signed. A proof of the very rare 4th state (of 7). After the complete removal of all the original aquatint and completely linear- etched anew. With the number 12 in the top plate border. Before the additions to the trees at the right; before all addresses. On cream wove paper. A little soiled in the margins. RAYMOND TEAGUE COWERN R.A., R.E., R.S.W. Cowern was awarded the Prix de Rome in 1937 and spent two years in Italy as Rome Scholar in Engraving, returning to England in the summer of 1939 before war was declared at the beginning of September. Based at the British School in Rome itself, Cowern travelled quite widely while he was there and all seven of the etchings he produced during this period were of subjects outside of Rome. 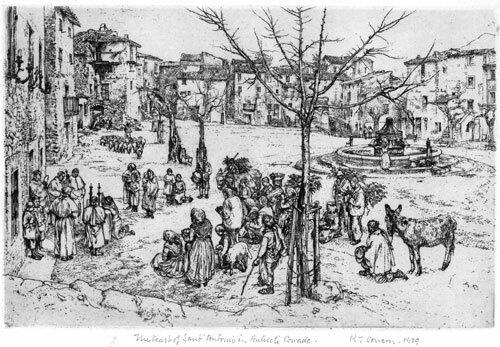 The hilltown of Anticoli Corrado appealed to him particularly and inspired three plates. About thirty-six miles from Rome, Anticoli had first supplied models to Rome, before artists began to visit the village itself and it developed into an artists’ colony. Job Nixon, an earlier Prix de Rome scholar had bought a little house there and lent it to subsequent students. Cowern spent the winter months of 1938-39 in the village. Cowern printed and exhibited only a few proofs in the late 1930’s and early 1940’s. He editioned the plates, in up to fifty impressions, in later years. Signed in pencil, dated and entitled. An early proof impression, printed on cream laid paper. Anderson’s taking up the technique of copper line engraving roughly coincided with the start of his great series recording and celebrating traditional crafts. The meticulous clarity inherent in engraving allowed him to show all the tools of the various crafts in great detail, and incidentally with great accuracy. The craftspersons depicted in the series are specific portraits of Oxfordshire practitioners. His Heaven commences ere the world is passed. Signed in pencil. Edition of 65. Annotated as usual. On laid paper watermarked OWP&ACL. 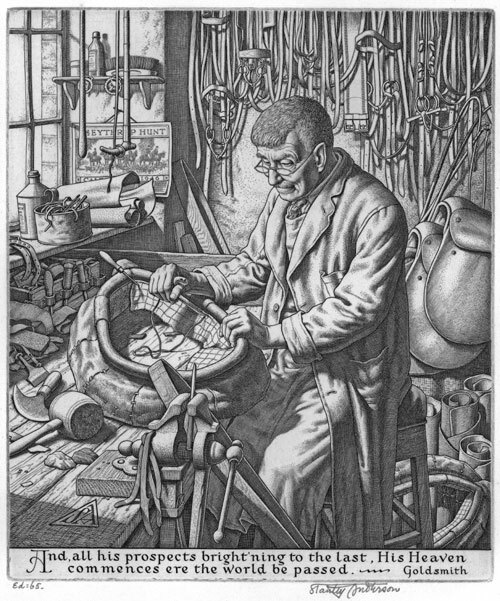 A study of William Bowl in the front room of his home in Witney Street, Burford, repairing the lining of a horse collar. Anderson shows Bowl’s tools in great detail. He is sewing with waxed hemp threads and pushing his needle with a saddler’s ‘palm’. On the bench beside the mallet are lumps of beeswax, used for brown stitching, and blackwax, for working harness. The spike in the vice was used for stretching donkey raw-hide thongs, seen lying over the vice, to soften them before greasing. Behind the saddler are two pigskin saddles, which would each have taken about a fortnight to make. “…The saddler is a dear old craftsman of 82 who still rides to hounds with ageless zest and has not missed a meet for 63 years”. The Heythrop Hunt calendar on the windowsill alludes to this passion.